I got some summer products (including a back-to-school one) to review for you. These were all given to me to test out - as always, they include my honest opinion. I'm a bit of a freak when it comes to sunscreen, since skin cancer runs in my family. Not like it's genetic, but my skin is pale (my kids' skin too) and I grew up in Arizona. So we bring the sun block everywhere. 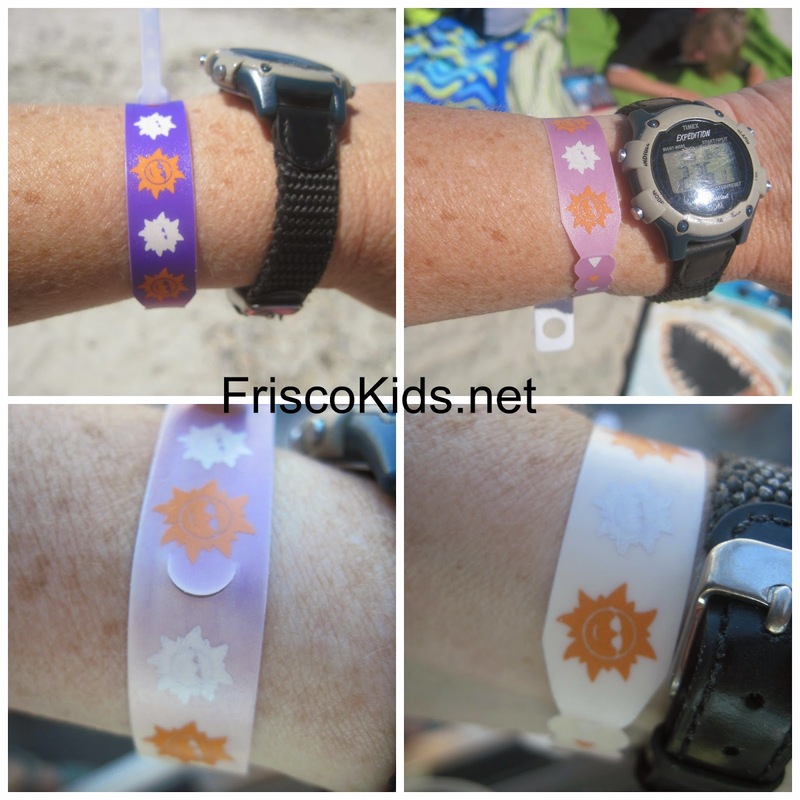 I was very interested in trying out these sunscreen bands that let you know when it's time to reapply sunblock and when to get out of the sun. out of the package and expose it to the sunlight for a few seconds (that's all it took in the Cape Cod sun). In the package it's off-white and turns dark purple in the sun, so you know it's activated. Put on your sunscreen - and put it on the band too. You need to use SPF 15+ for it to work. Then go about your business outdoors, checking out the band as time goes on. It's waterproof (but wait 15 minutes after putting sunscreen on the band to go in the water). The band will lighten up it gets closer for you to put on more sunblock - when it's light purple. Then when the band turns a cream or white color, you have had your daily fill of sun exposure. Go inside or get shade. You can go inside and outside with the band on, and it will continue to work - measuring the sun exposure. You can learn more about how it works here. I really liked having the band and the kids were all interested in watching it as it turned colors. Only one person really needs to wear it if you're all together (like at the beach). The bands cost $10-12 for 10. Just keep them inside the package, so you don't expose them to light and use them all up in one shot! We did go in soon after the band turned white. We also applied additional sunscreen when it turned purple and we didn't burn. Perhaps we wouldn't have burned even without the bands, but it's a nice way to remind yourself when it's time to add protection. 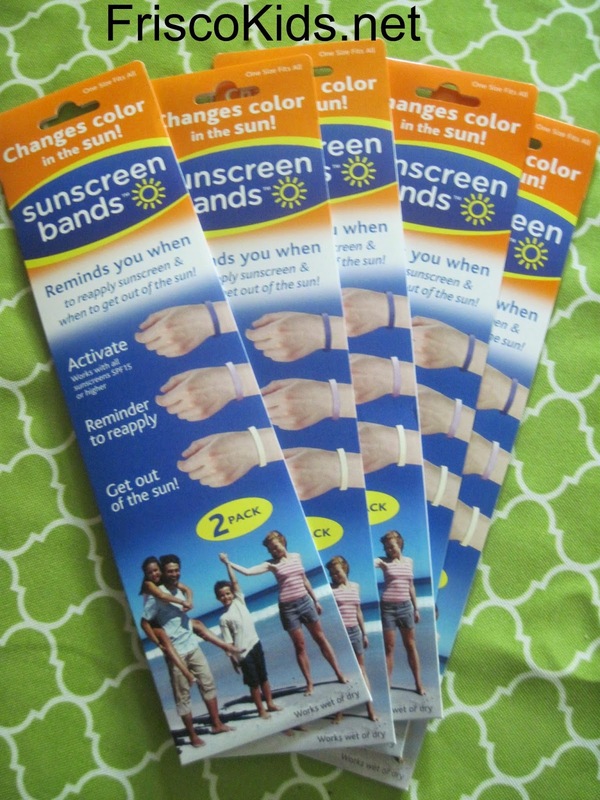 You can buy sunscreen bands here. We got this GoScreen mineral sunblock a few years ago and I hesitated to post about it then because I wasn't sure of whether I liked it. Since then I figured out how I want to use it. 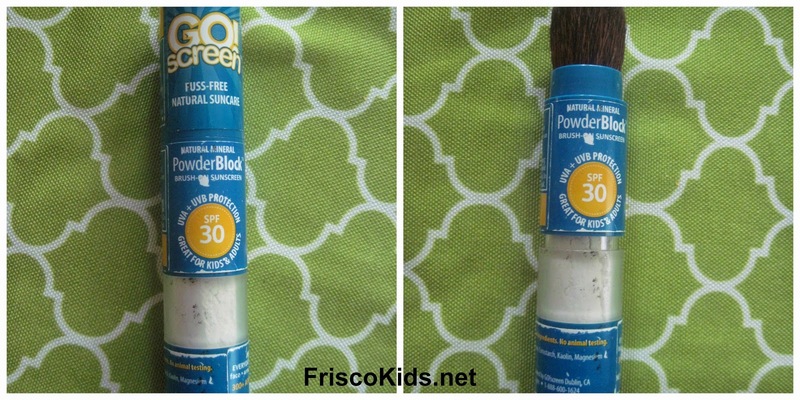 The mineral sunblock provides a physical block instead of a chemical block. A few things I don't love about it. To get the powder into the brush you have to pump it from the bottom (you can't see the pump in the picture). It takes a bit of pumping until you see the powder come into the brush. Some have complained in online reviews that the applicator gets stuck (reviews have also said that the company is good with customer service and replacement). I've not had that problem, but I do spend time pumping. I'm also never quite sure I have enough on. You can't wear it in the water because hey - it's a powder. And it's difficult to use all over your body because of the applicator size. What I do like it for is to bring with us for facial/neck touch-ups and for hair part lines, especially if we're at a place like an amusement park. I always bring it with us to Disneyland and put some on my face and the kids' faces (and scalps) while we're waiting in line, just to be sure we're covered. The powder works better on the scalp than rubbing in lotion - at least it's less greasy. You can pack it in a carry-on since it's not liquid. I don't think it's being sold anymore, because it's unavailable on Amazon and their website is gone. So now I just got you all excited (or not) about a product no longer available! But there are other mineral sunblocks out there, maybe even just powders with SPF you can try, like Mineral Fusion and Colorscience which comes in a similar tube with brush applicator. There are some others I saw on Amazon too. AtttachaPack originally caught my eye because they offered a bulletproof shield inside the backpack. Bulletproof! And indeed you can buy an insert to make sure that if Junior gets shot while wearing it, that there's good chance he'll be fine if the bullet went into the pack. But the reason I agreed to try an AttachaPack is because it's customizable. You choose the style, color, type of pockets and pocket color/design. You assemble it yourself online. Or rather, my son did, because when he saw this he wanted it for himself (and indeed he has now claimed the pack for school since he said he needed a new one - his old one is still fine, but he said it smells). It's the kind of company that makes you think, "duh - this just makes sense. I should have thought of it." For someone like me who suffers from an inability to make decisions, even on things that don't truly matter (for me that would be a backpack pocket color), this type of site just kills me. Too many options! For people like me they offer readymade backpacks. But for people like my son, who thrive on choosing just the right color and style, it's a godsend. He LOVED putting together his pack. And because the pockets zip on and off, you can change your pack whenever you want. This is the same backpack (above) that has different pockets zipped on, changing the look in seconds. The side pockets zip off too - you can have an infinite number of looks. They offer three different backpack styles, and on the website you can see how the backpack sits on a man, woman and child, so you can judge size and fit. They have some fun accessories too, including zipper pulls and water bottles. They mentioned that they might offer pockets with cold packs for lunch, which would be awesome. They don't have that yet. The one thing they don't offer is name embroidery. Another cloth item to review is this Travel Square. This multi-purpose "bag" can hold things you want to take with you when you...travel. There are plastic covers inside (like in the middle) to hold and keep your electronic device clean. The strap can hang from a seat back, or the whole thing can open up onto a tray table. 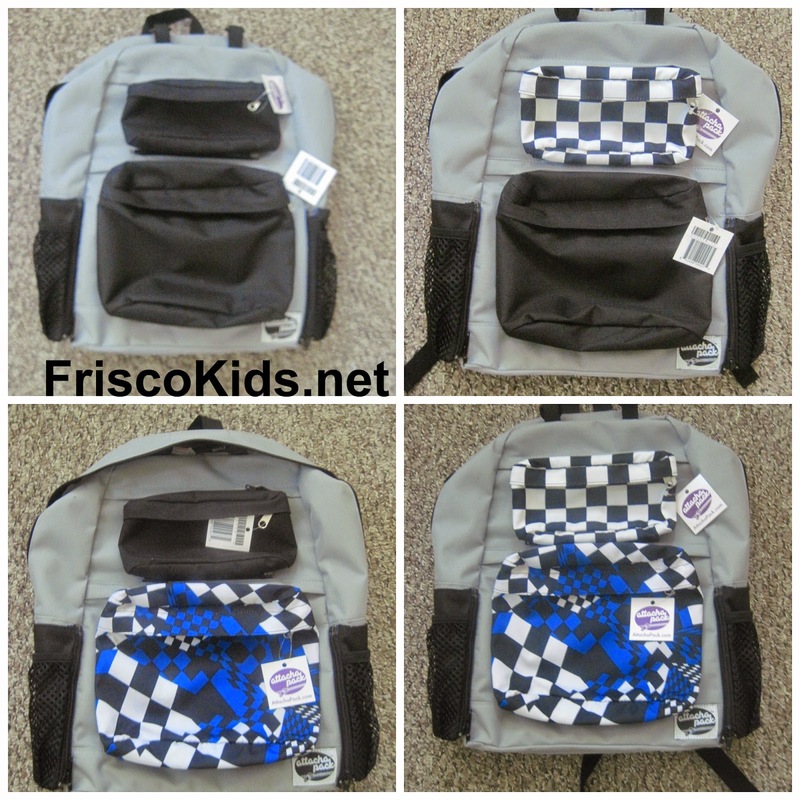 It's light enough that the kids can carry their own things - like coloring books, other books and electronics, and it closes up with big velcro straps. 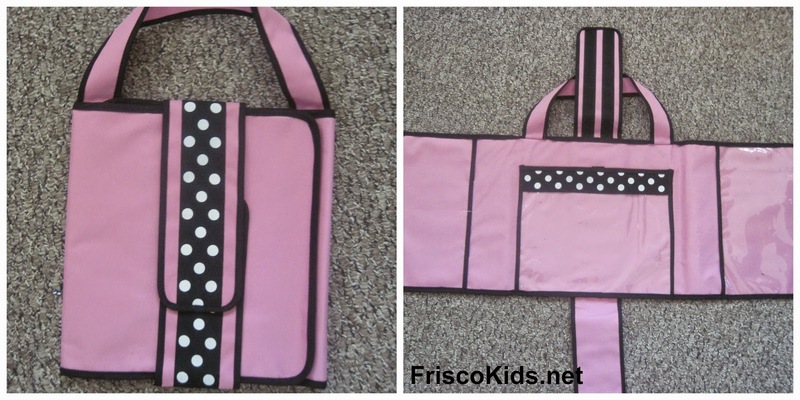 The only one they had in stock as of this posting was the one they sent me - the pink with polka dots. This won't work for all kids (my son, for one). I think the Travel Square is best when you don't need to carry much. My kids tend to take big backpacks with them when they travel (philosophy: you can never have enough stuff) so this was a little small for their purposes. But I think it's great for younger kids who can have just what they need available to them in the car or plane especially. It would be good to take along to dinner or the beach as well.